If you follow my page regularly (or if you just take a quick scroll through)- you know I love me some Tex-Mex food! 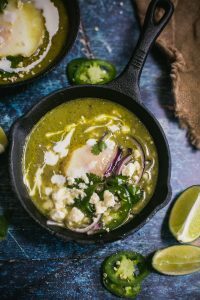 I’ve had tomatillos on my mind for quite some time but I just wasn’t sure of how I wanted to use them in a recipe. I’ve never really used them before and there are a ton of ways you can prepare them- but I decided to use them for a delicious and easy breakfast recipe. 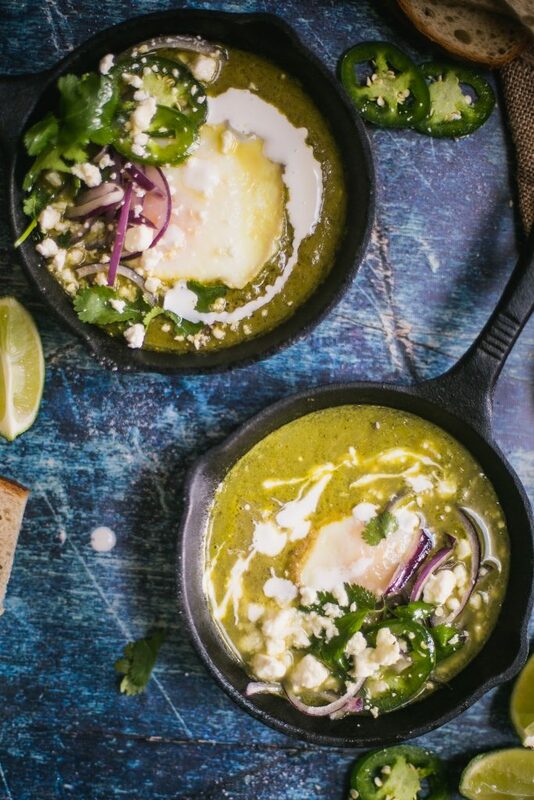 Tomatillos can be found at most regular grocery stores and or hispanic markets. They have a papery outer husk you should remove and then rinse each tomatillo well (they are quite sticky). I decided to roast them to really get the most flavor out of them (versus boiling them to cook them down) along with some onions and jalapeños. After the veggies were roasted, everything goes into the blender and you get this delicious, tangy, spicy, velvety sauce that smells SO DAMN GOOD. This is great for a crowd because it really doesn’t take too much prep time or much clean up either. I topped this off with some sliced red onions, feta (didn’t have any cotija or queso fresco on hand), a nice squeeze of lime juice and as always some CILANTRO! I hope you guys enjoy this recipe as much as I did! 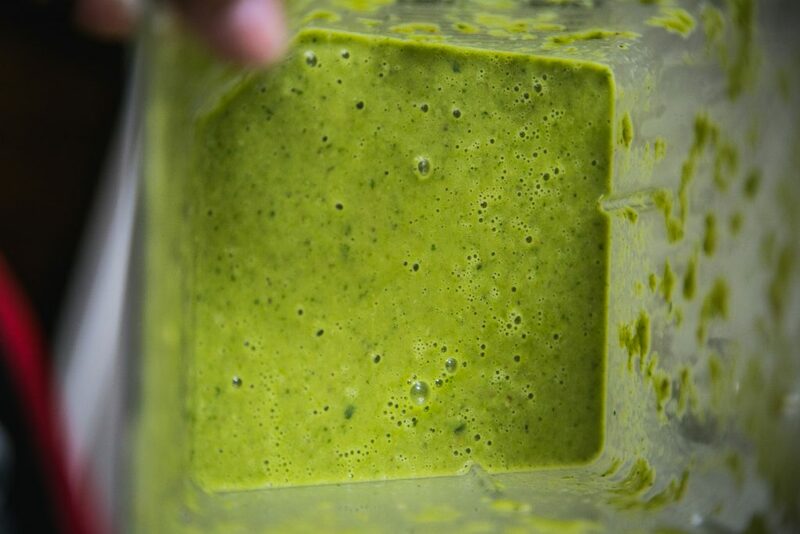 Add in handful of fresh spinach or kale to make this more nutrient dense. Replace the jalapeños with some serranos for extra heat. 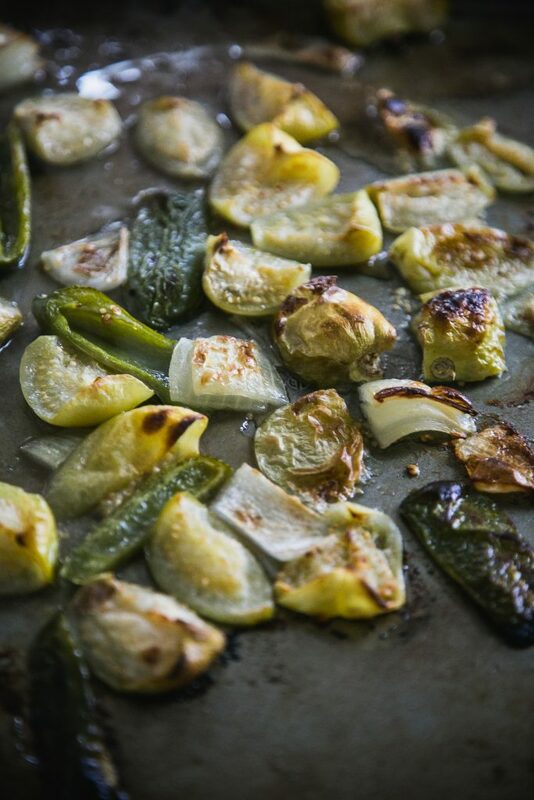 Add in one or two roasted poblanos for more yummy goodness. 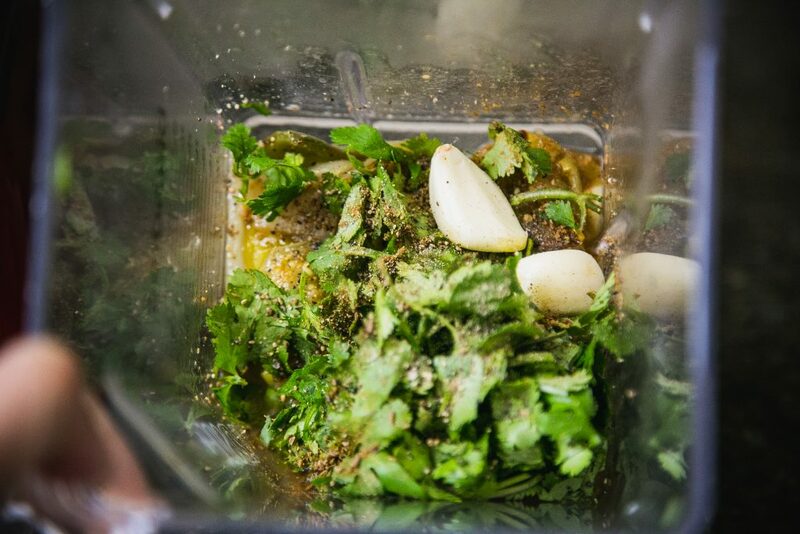 Add in a pinch of garam masala for a more Indian flavor. Make double or triple this batch and keep in the fridge for a quick and effortless weekday breakfast. All you’ll have to do is crack in some eggs! Turn your oven on low broil. 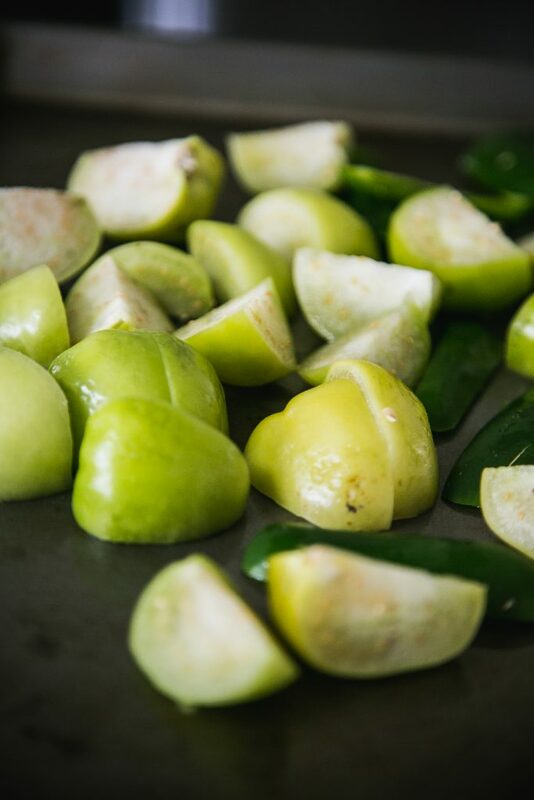 Remove papery husks from tomatillos and wash each one well. Quarter the onions, tomatillos and slice the jalepnos lengthwise in half. Transfer to a baking sheet and drizzle with oil and season with salt and pepper. Place in oven under low broil for about 15-20 minutes until they are slightly charred and softened. Transfer from the baking sheet to a blender. Add cumin, garlic, cilantro and blend until smooth. Taste for salt and spice- add more if needed (you can add more jalapeños). Add the vegetable or chicken broth, hot sauce, and blend until smooth. Heat a skillet over medium high heat and pour the mixture from the blender directly into the pan. 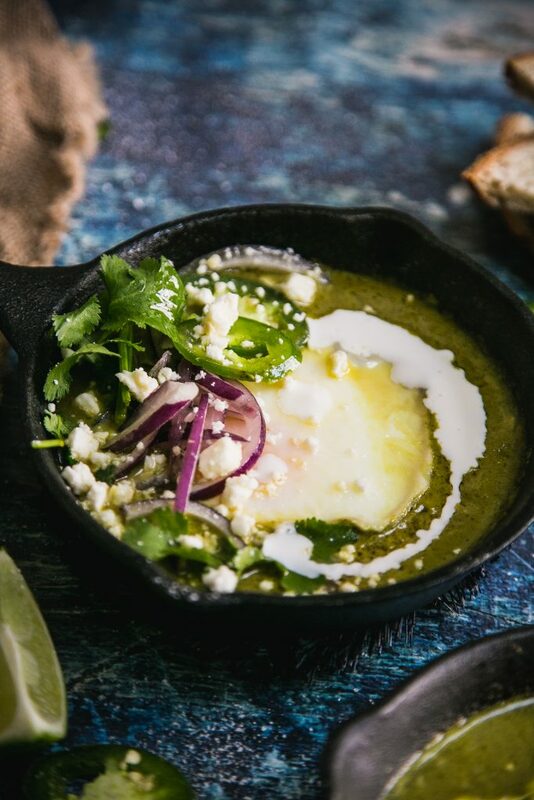 Crack in eggs directly into the skillet (leaving space between each egg). (I gently poke each egg yolk to make it cook quicker ( I like my eggs only slightly runny). Cook until desired consistency of egg is reached. Remove from heat and top with your choice of crumbled cheese, extra hot sauce, squeeze of lime juice, and sliced red onion. 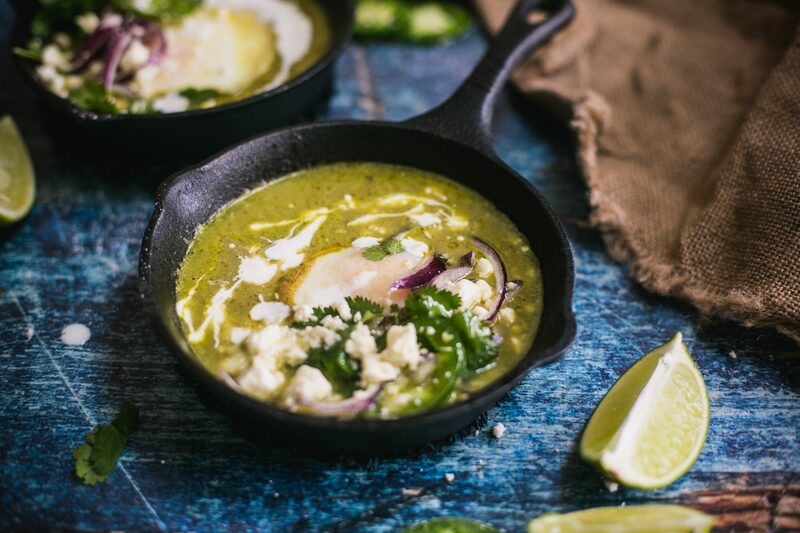 Serve with toast, hot naan or even crushed tortilla chips!